Today’s confluence of new digital technologies, new devices and people’s lifestyle preferences is a revolution and offers vast opportunities for innovation, new businesses, and a better life. The digital revolution concerns all industries. Embracing the revolution has many benefits. Trying to resist is very risky. Startup companies are at the forefront of this digital revolution and are commercializing innovations in many areas. 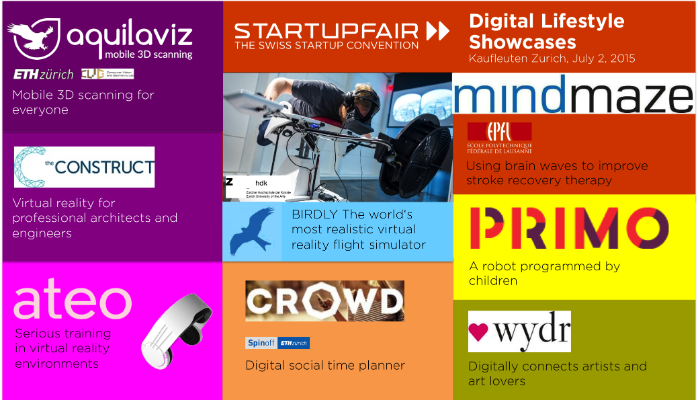 Startupfair 2015 makes the digital revolution visible by showing “Digital Lifestyle Showcases”; Swiss startups demonstrate their solutions for the digital age. All industries are touched by the arrival of new digital technologies, and some will be transformed forever: Farmers increase crop yield by using drones with sensors and cameras to compute fertilization patterns. Large supply chains may be replaced by on demand and on site production: A 3D printer recently printed 10 single family houses in just one day*. And service businesses continue to be disrupted by internet businesses and the sharing economy, as can be witnessed by the very public conflict between traditional taxi and delivery service operators and the Silicon Valley company UBER. Resistance has been the choice of some industries, trying to preserve the status quo. However, this will prove to be a risky strategy – ask Kodak who believed that photos would continue to be recorded on film until they saw themselves swept away by digital photography. Instead, other industries choose to embrace the possibilities of the new digital technologies and are enjoying the benefits: Whilst successful Hollywood movies used to be released as video games later on to extend revenue streams, the trend is now reversed. Lara Croft: Tomb Raider was the first video game to be released as a movie, and it proved to be a blockbuster success in both categories. Several movie adaptations of video games followed. And the trend is even more accentuated today with new movies being produced for distribution exclusively on digital movie-on-demand networks, such as Netflix’ House of Cards. Concerns about overwhelmed customers are unnecessary. Today’s consumers have gradually been accustomed to include digital technologies, devices and services into their lives. We have used the internet for 25 years, it has been 20 years since the first mobile phone included internet connection**, our homes and mobile phones have had high speed internet for 10 years, and it has been almost 10 years since Apple’s iPhone set the standard how we select, purchase and use apps to improve the way we live, work and enjoy our spare time. What’s more, people born after the birth of the internet already make up half of the population in some countries***. And they have entered the workforce. As a consequence these Millenials constitute not only an attractive consumer market segment but also occupy an increasing number of corporate decision maker positions. No doubt: Resistance is futile – and unnecessary. Because modern consumers simply expect today’s products and services to include digital technologies. Vendors who resist are lacking on a basic requirement to compete. Welcoming the digital revolution on the other hand brings about commercial successes, renewal of product portfolios and breakthrough innovations. What breakthrough innovations does the next wave of the digital revolution bring? Which industries and which parts of our lives will be touched by them? BIRDLY is the most realistic flight simulator today. It combines technologies from 3D game design and robotics to provide an unparalleled experience. Or in the words of John Gaudiosi, journalist writing for PC World magazine:“How virtual reality stole the show … the hottest ticket at the 2015 Sundance Film Festival was the virtual reality flight simulator BIRDLY”. Birdly was developed at ZHdK, the Zurich University of the Arts. Everyone can create their own 3D pictures with just an ordinary smartphone. Send the picture to a 3D printer for instant production. Aquilaviz is a spin-off of ETH Zurich. Ateo produce training software for the safety industry. Virtual reality provides an immersive experience and more intense simulation than possible ever before. CROWD is the planner for get-togethers and social time management for digital natives. Much more than an app, its predictive functionalities help users make the best use. theConstruct automatically virtualizes 3D models so that architects and engineers can inspect their woks even before they are built. Imagine controlling a video game solely with your thoughts. This is how Mindmaze helps patients retrain their brain after suffering from a stroke. Clothing with integrated health technologies: Prezenseshirts detect stress levels directly on the spine, e.g. for therapy of drug rehabilitation patients. Primo develops toys that help children learn and create with technology. E.g. a robot programmed by children. This app learns what kind of art you love. And starts recommending better and better suited art pieces. It also provides artists a digital promotion and sales channels for their works. Previous PostSwiss Startups are too modest – Startup-Battle to break the spell!